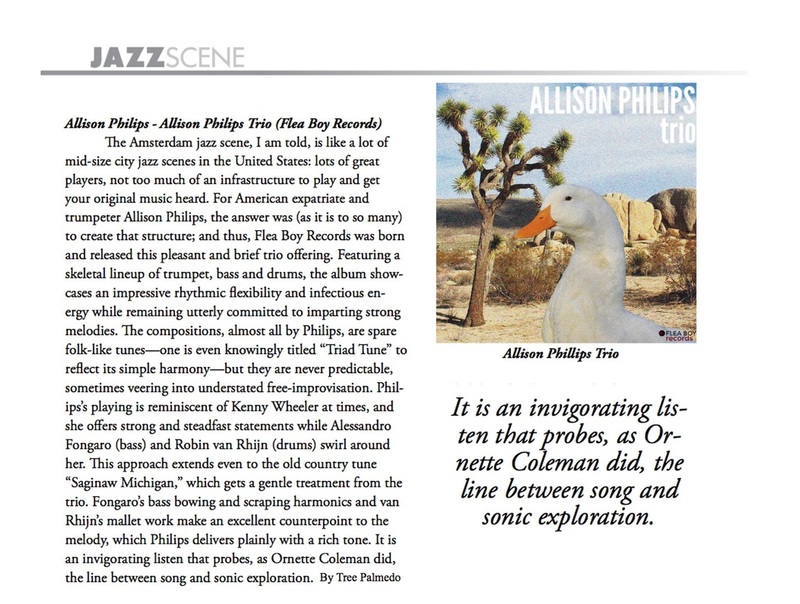 An up and coming trumpet player currently residing between New York City and Amsterdam, Allison Philips has been performing steadily since she was 14. A native of South Orange, New Jersey, Philips began playing the trumpet at the age of 9 after being inspired by a report she wrote on the great Louis Armstrong for African American History Month. Since then she has gone on to perform at many aclaimed venues including, but not limited to The Bimhuis, The North Sea Jazz Festival, Le Poisson Rouge, Iridium, Zinc Bar, 54 Below, The Jazz Standard and NJPAC. In the Spring of 2014, Philips lead a quartet for one week at The Bern Jazz Festival in Switzerland. In the Fall of 2017, Philips lead her trio at the esteemed Festival of New Trumpet Music in New York. In 2014, Allison recieved a BFA in Jazz Performance from the prestigious New School For Jazz and Contemporary Music in New York City. She has recently been awarded her Masters in Jazz Performance at The Conservatorium Van Amsterdam, in Amsterdam, The Netherlands. Allison was the winner of the 2016 Hal Leonard Collegiate Scholarship. Allison has been fortunate to study with many different trumpet luminaries including Laurie Frink, Ingrid Jensen, Chris Jaudes, Tatum Greenblatt, Joe Magnarelli, Jimmy Owens, Ruud Breuls and Jan Oosthof. Allison is active both as a leader and a sideman. She co-leads a group with Canadian bassist Mike DeiCont titled The DeiCont | Philips Collective. The band has just released their first, self titled record featuring Louis Cohen on guitar, and both Alex Kirkpatrick and Connor Parks on Drums. 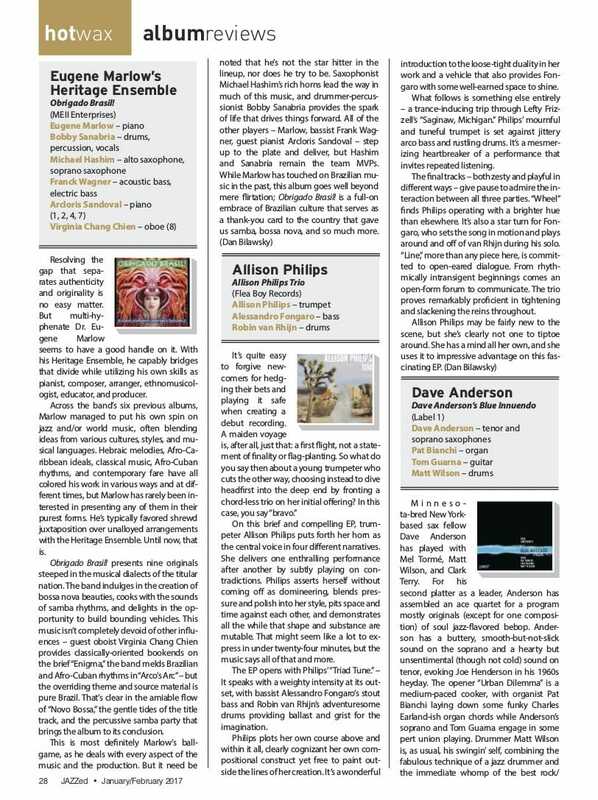 Allison's trio (with Alessandro Fongaro and Robin van Rhijn) released their first EP in Fall 2017. Over the years she has performed as a sideman with a large variety of groups including but not limited to: Phil's Music Lab, The Chronometer;s Orchestra, Charlie Rosen Broadway Big Band, Pedro Branco Quartet, Joe Benjamin and the Mighty Handful, Sara McDonald's "NY Chillharmonic", and The Konrad Koselleck Big Band.